Based on Murray Burnett and Joan Allison's play, Everybody Comes To Rick's, the classic movie Casablanca was released on January 23, 1943. Ah, Casablanca. Classic film noir with that bittersweet ending. I wasn't even born when it came out, yet I rewatch it about once a year. Recently, on a rainy evening, I yanked out my DVD for a little Rick-Ilsa-Victor-Morroco fix. I love that movie, the film noir look, the era and especially the soundtrack. As Time Goes By is a beautiful piece of music and that classic piano scene where Sam (Dooley Wilson) performs it is my favorite part of the movie, and, of course, provides one of the film's most classic quotes. I had also recently been working with Fernet Branca and "Casabranca" just popped into my mind. I put the disc on pause and headed to my bar. 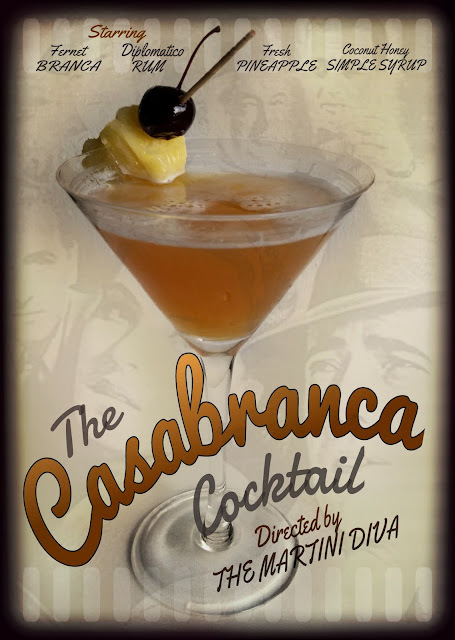 After all, what's a classic forties movie without a cocktail? Though gin was a more popular liquor during World War II, the Diplomatico was my choice to pair with the Fernet because, of the pineapple juice and coconut honey. With the (bitter) herbal Amaro balancing the sweetness of the pineapple juice and honey, it turned out to be a "cocktail noir" of a pina colada. Yeah, its a pun but, come on, it's a really good pun for a really good cocktail and "il est un cocktail parfait" for Casablanca viewing! Chill your glass in the freezer. Fill a cocktail shaker with ice then pour in the rum, Fernet Branca, pineapple juice and the coconut honey simple syrup (*warm 1 heaping tablespoon of Coconut Honey Creme with 1 HOT tablespoon of water) and shake until chilled. Pour into the cocktail glass, garnish and serve. * Often misquoted as "Play it again, Sam.